There are many ideas that can transform Pakistan and one of them is to envisage solar power stations. They could provide clean energy that will never cease and allow all Pakistanis to have a good standard of living. Solar Power Stations are to be contrasted with solar panels that are good on a local or individual level, (CSP) Concentrated Solar Power, as they are known are for powering industry, transport and buildings. They would take a large start up cost but that could be loaned from World Organisations or countries such as the Arab States. Already some are planned; the far sighted Abu Dhabi is building a Solar City at Masdar and CSP plants are planned in Morocco, Libya and Algeria. A unified grid would be needed, known as (HVDC) high voltage direct current, to enable the power to be circulated; excess can be stored in melted salts. My painting is of a Dish power station. There are also other ones including a Power tower, parabolic trough and Fresnel mirror system. CSP is a particularly good technology for hot desert regions as the heat gathered from the sun using mirrors is concentrated and used to power a steam turbine thus creating the electricity. Desalination plants could be set up and also powered near the coast to provide water for the station giving water and shade as waste products. It may be possible to thus also grow vegetables and fruits around the plants. Other systems could also be fed into the grid; hot rock, wind, HEP and tidal turbines. This will reduce the amount of carbon dioxide in the air so as to help global warming, as otherwise deserts will increase, and without the set up and decommissioning costs of nuclear power. My paintings have brought back to these magnificent creatures to the wonderfully wild mountains of the local area. 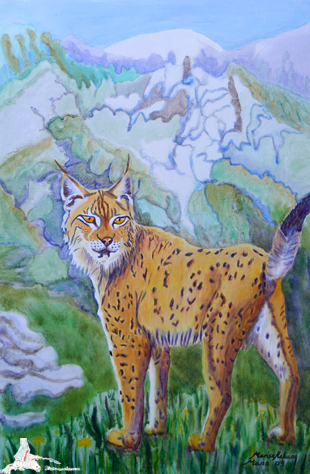 I shall be putting the Eurasian Lynx back in the Canigou Massif in the Pyrenees, France with my gallery there. They were sighted until 10 years ago and there are plans to re-introduce them. 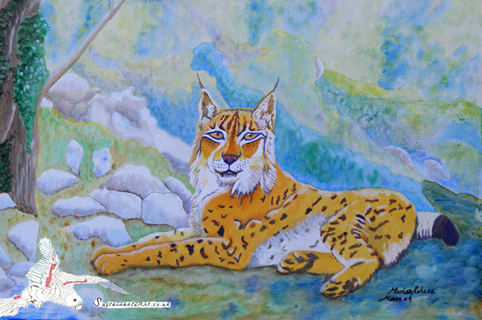 The paintings are based on studies taken from http://www.whf.org.uk/cats.cfm?id=lynx in Kent where there are a number of large cats. Once upon a time there was a planet inhabited by creatures without much fore or hindsight. Somehow some of them got in charge of looking after the institutions where the vast majority kept their savings. This was strange because none of them had the extremely difficult qualification of previously running a market stall ,so they had no idea that they could not keep lending their customers fruit and vegetables ,or even allowing them to bet on the future price of legumes ,or the stall holder would go out of business. Luckily for them the creatures chosen by the majority of everyone to check on systems had no idea either. They were only experienced in having nice trips and boat rides and the two groups became a kind of oligarchy, each granting the others large sums and future payments and occupations for when they went on to fully enjoy themselves. Eventually there was a huge gap in the actual savings that everyone else had put in these societies and what had been paid out and mass panic took place with lots of communications on how could this have happened? The creatures in overall charge said no one could have seen this coming and solved the problem by enslaving the great grand creatures and there was much hand ringing and confusion. However nothing was done to introduce a system of training to send the ones looking after savings to learn with stall holders. In fact they started to get cross that they were being criticised in small sections. Also the rulers put nothing in place to stop this happening again, but as the two groups own funds were carefully safeguarded even though everyone else was doing terribly badly, these two groups lived happily ever after. I participated with The Campaign Against Climate Change to provide an art work that became a banner for the March On Parliament. The inspiration for the event and the art work was to highlight some serious decisions that have been taken that will not benefit society in the long term, and I have visually expressed my concerns. * Vast forests are being burnt down and crops grown for bio-fuel. – deprives people from food supplies. 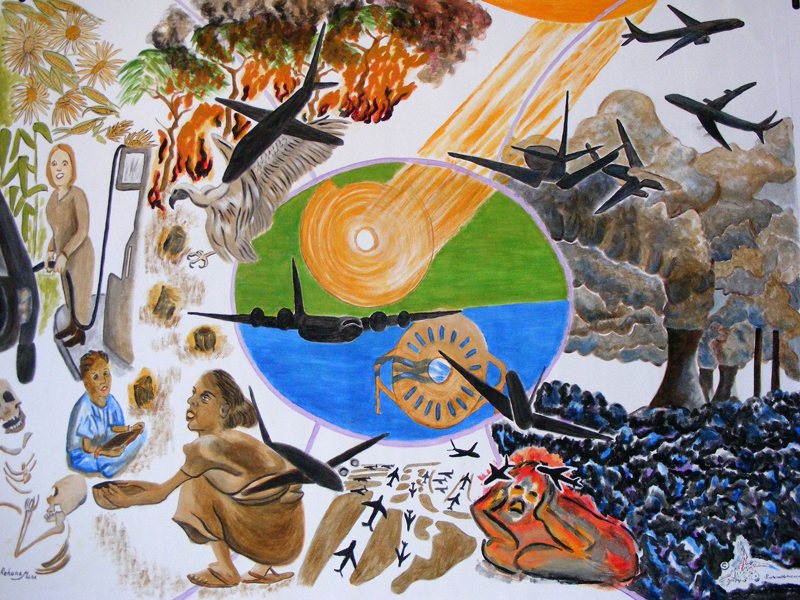 The second theme is against a third runway at Heathrow. The government’s argument is to compete against Europe, rather than investing in useful, more welcome alternatives, such as a faster more efficient rail system. The third theme is against the new development of coal fired power stations rather than a longer term investment in less damaging energy solutions. 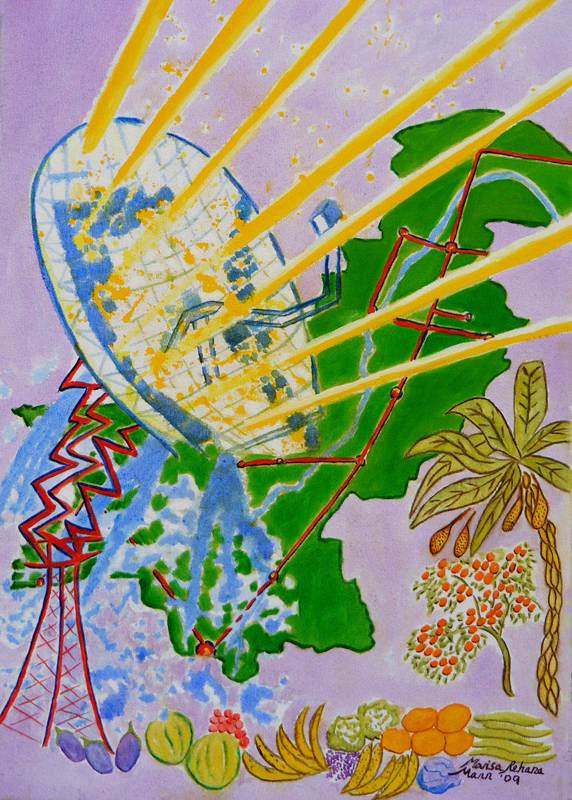 The last theme in the painting show alternatives; solar and sea power. We could easily invest in these technologies now and not leave an expensive, dirty and possibly dangerous legacy for our children. The technology is there with simple and rewarding solutions. The alternative solution proposes a unified grid from North Africa through solar power stations, delivering electricity under the Med to Europe. It will be more abundant than we need, and can be linked to other renewable sources. It was a great pleasure to participate with this forward thinking organization. I was awarded a bursary from the Arts Council to to make a special report on Dada-South, Liverpool, and to study a special area in the Lake District. It occurred to me that the artists at this exhibition had such interesting faces. One can see this with orchestra conductors and this was my impression here. There were just so many fascinating people to look at and especially when they were performing. Any disability was completely passed by and you could see what an amazing number of different artists we had the privilege of meeting and experiencing. The weather was too cold for me to do the work there so I have taken a number of photographs and short films, together with very rough sketches and have painted Kevin Connolly’s portrait from these. It is preferable to have someone to sit for at least two days and it was very challenging to go back to working from images, rather than the real person and I have tried to capture the enthusiasm and character of this remarkable young photographer. The other image is of the spider seen inadvertently while trying to find the festival, it was so amazing I stopped in traffic to capture the creature hanging off the side of a building.